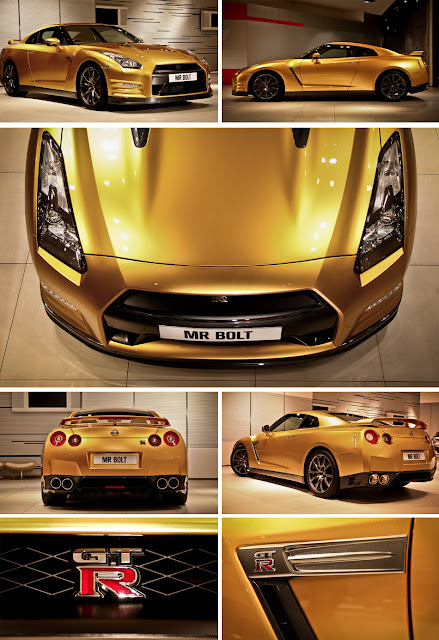 YOKOHAMA, Japan - (December 14, 2012) - Nissan Motor Co., Ltd. raised a total of $US 193,191 from the 'Bolt Gold' Nissan GT-R and Bolt Merchandise online charity auction held on eBay from November 22 to December 4, 2012. All proceeds from the auction will be donated to the Usain Bolt Foundation to help with its mission of creating educational and cultural opportunities for children and young people in Usain Bolt's home country of Jamaica. Competition for the one-off 'Bolt Gold' Nissan GT-R was fierce, with offers stemming from around the globe during the ten-day auction, culminating in a winning bid of $US 187,100. More than 100 people also competed for nine items of Bolt merchandise on the auction block, including racing helmets, special driving suits and boots, which brought in a total of $US 6,091. "In doing good with this donation to the Usain Bolt Foundation, Nissan will help children in Jamaica do better as they strive to realise their dreams for the future," commented Nissan's Chief Operating Officer, Toshiyuki Shiga. In October 2012, Usain Bolt was appointed Nissan's honorary "Director of Excitement" as a brand spokesman for the company's new "WHAT IF_" global brand campaign. Blue Citizenship is the commitment of Nissan Motor Co., Ltd. to realize our vision of Enriching People's Lives. We commit to our customers, shareholders, employees and the communities where we do business to deliver engaging, valuable and sustainable mobility for all. Through our business activities, we aim to create economic value and to actively contribute towards the development of a sustainable society. Nissan Motor Co., Ltd., Japan's second-largest automotive company, is headquartered in Yokohama, Japan, and is part of the Renault-Nissan Alliance. Operating with more than 248,000 employees globally, Nissan provided customers with more than 4.8 million vehicles in 2011, generating revenue of 9.4 trillion yen ($US118.95 billion). With a strong commitment to developing exciting and innovative products for all, Nissan delivers a comprehensive range of 64 models under the Nissan and Infiniti brands. A pioneer in zero-emission mobility, Nissan made history with the introduction of the Nissan LEAF, the first affordable, mass-market, pure-electric vehicle and winner of numerous international accolades, including the prestigious 2011-2012 Car of the Year Japan and 2011 World Car of the Year awards.